A famous legend has it that Milo the Greek developed his super-human strength by lifting a young calf while he was still a young shepherd boy. Over time, as the calf grew into a bull, he continued to lift it, the result being that his strength increased in proportion to the size and mass of the bull he was lifting. This story is often quoted to illustrate what is perhaps the most important and foundational principle behind developing a successful training programme - the PRINCIPLE OF OVERLOAD. Basically, this principle states that in order to see progressive gains (in this case, running or cycling faster), you need to progressively increase the load (distance or speed of running or riding). However, in order to fully understand the principle, a basic knowledge of physiology is required, because it's not as simple as just running a little further every day! If this was true, you could add 500 m to your daily running distance and in a year's time, you'd be running 180 km non-stop!!!. Obviously, this is unrealistic, and the reason it doesn't work is because it does not take into account the fact that you have to RECOVER as well, which is principle number 2. So in order to make sense of these training principles, it's important to understand a famous principle from biology, which explains why you get injured, overtraining, burned out and also why you can, if you are wise, improve performance. This is the Selye Adaptation Principle. Occurs immediately after the stress is perceived. During this stage, your performance will be impaired as the stress must be responded to. So if you've ever noticed that soon after starting to train, you find that you just seem to be getting worse and worse...this is the reason. More specifically, this is why immediately after a session, or even up to two or three days after certain sessions, performance is impaired and the athlete will feel that the training is making them worse, rather then better. It's also the reason why resting and recovering as so vital - your body is dealing with the training, and anything you can do to help it is of course, very welcome! This follows the alarm reaction and will occur only if the stress is ‘manageable’. That is, you must be able to adapt and recover sufficiently from one training session to the next. This is the reason that the severity of training must be altered, and is the major reason why rest days and easy days are essential in any training programme. 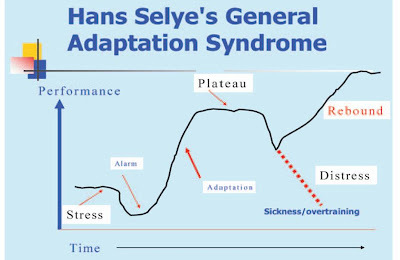 The period of adaptation is what we are all aspiring to achieve, and requires a sustained period of training and recovery. We'll cover these tricks of the trade in future posts. This period occurs because your body has responded maximally to the stress and no further improvements in performance are possible. Most training programmes will end here, or a new stimulus is required, otherwise you can gradually worsen and eventually fail. If the programme has worked successfully, your racing season or your goal race will occur right at the start of the plateau phase, and will be followed by a period of inactivity and a new training programme, designed to push the athlete beyond the plateau. This is a dangerous period, because it precedes the stage of failure or distress. Performance stops improving and the temptation is often to train harder or faster, and this means that the stressor is increased, which actually pushes the body into the alarm stage, and only serves to worsen performance further. So begins a cycle of deteriorating performance. This stage occurs if the stressor is not managed appropriately, with the result that you cannot continue to adapt and respond to it. Performance then deteriorates rapidly and you become sick or overtrained or injured. This happens when there is insufficient rest and the severity of the training stress (distance and intensity and frequency) are not managed intelligently, as described previously. This is also something we'll cover in detail in the future - how do you put together the programme to minimize this risk? The goal of a training programme is, as described, to ensure that this stage is never reached, but rather that you recover sufficiently for the training stress to be altered to cause what is known as a rebound, where performance improves rather than worsens. The simple take home message from this, is that if you want to get faster, then you must run faster than your currently ‘comfortably manageable’ speed. Similarly, if you want to improve endurance, you must constantly aim to run further than you have previously done in your training. But it's just as critical to realise that you also need rest, otherwise you will very quickly enter the "FAILURE STAGE", and end up burned out, injured and overtrained. In future articles, we'll cover the specifics of how to achieve this - how much rest is needed, when is training too extreme, and other tricks that you can use to make the most of your training time! Australia - cricket's first dynasty?